Having heard about some of the work we are doing at Pearson at a high level, I was asked to share our story so far developing and rolling out the Global Product Development Lifecycle at Pearson with a broad audience spread between Product, Technology and Marketing as well as other functions at Tesco. Tesco is a very familiar UK brand who manages a workforce of over 500,000 employees and are most known for their supermarket stores. However Tesco have a very diverse portfolio with a range of products ranging from banks to mobile phones and services. Like many large Enterprises, digital product development at scale isn’t easy all large companies are managing the shift to survive and pioneer the digital world. Companies are now expected to build long term relationships with customers over a long period of time where customers are fickle and free to choose alternatives at a click of a button. I recently touched on this topic when comparing Products Vs Projects. The audience were particularly impressed and empathised with the structure of the Product Lifecycle and how we are progressing the way we develop products, using more iterative means, and embedding principles and practices from Agile, Lean Startup, Lean, Beyond Budgeting, VC Funding models and influences from other companies adapting to a more digital world. I personally believe sharing outside our own environment is a good opportunity for us to learn about how other companies solve the problems they encounter and also obtain objective feedback on our own progress. In doing so we discover new perspectives and new ways to solve problems. To explain the context to the slides displayed above, the general narrative is below. I hope you find these interesting and useful and please feel free to comment and feedback. 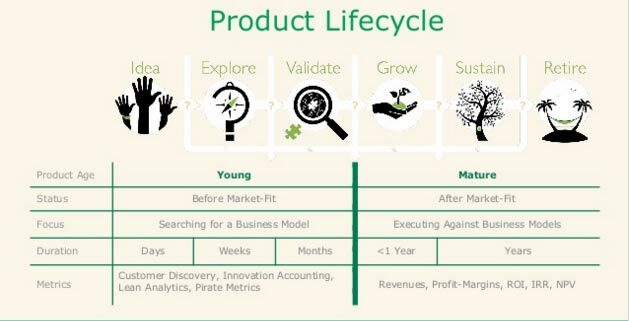 By using the framework of a product development lifecycle with the context of the organisational needs and domain, we are able to focus on the right activities at the right time during a products life; from ideation through growth to retire. Each stage of a product’s life is very different and understanding this in it’s simplest terms can change the way you approach the problem and de-risk the investment by discovering and testing the riskiest assumptions each step of the way. This involves embracing the culture that startups often naturally have into an enterprise, but in the context of an enterprise where we can utilise our advantages as such. Particularly this is where the brave and bold are rewarded for learning fast, sharing knowledge and getting to market quickly to start the journey of continuous feedback in close collaboration with the customer. For ideas to reach their potential in enterprises and for enterprises to improve their potential to innovate, they have to combat the inertia which is sometime imposed by large complex environments. Some of this naturally occurs through organic growth where functional silos develop and locally optimise efficiencies. When engaging with external communities across many different domains it’s not uncommon to for software teams to become extremely frustrated by these constraints. Having agile software teams doesn’t necessarily result in an Agile organisation. An agile organisation is one that is bound by the goal of satisfying the customers needs and works cross-functionally to achieve such. With the Global Product Development Lifecycle work at Pearson, we are coordinating and collaborating with over 18 enabling functions to work together and simplify governance and decision making as well as advocating customer and learner centric iterative development practices and product management techniques. This includes challenging many traditions included, but not limited to the way we think of budgets not being allocated, but funds where you have to continuously provide confidence and evidence the product will satisfy customers, learners and provide return on investment. It also involves working with HR support how teams can be rewarded and re-allocated to work on ideas sooner as well as how can we connect people internally as opposed to reaching out externally. It also involves looking at technology not as a series of platforms, but enabling environments which solve customer and learner problems through customer facing products and more. I hope you enjoy the slides and find the interesting, please ask questions for more information. Also if you have or are working on solving similar problems, feel free to get in touch and share some ideas. I have gone through your presentation on slideshare and I am really impressed with it. That’s why the curiosity rose in my to talk to you through this channel. I am Surbhi, Director of Product Development, CatalystOne Solutions AS, Norway. Through your presentation I realized that we are WAGILE. Our development team had adopted agile methodology in 2014. However since then we have been failing and trying. The good thing is that we have learning attitude and acceptance of the mistakes. That’s where I feel our growth is, the latest realization was that we need to be agile throughout organisation, however I was not able to understand how the concept works in practical. Through your presentation it became crystal clear as well as a few others presentation. Thanks for this. However, to be able to get much more of the crux of it. It would be good to get some audio visual part of it. I want to take out whole essence of it. Thanks for the feedback and contribution and I’m glad you found the presentation useful. Going through the adoption curve is like building a wall one brick at a time, particularly when it comes to culture. The feedback and learning loop is critical for internal development as it is to delivering product value. There are a number of things to consider when breaking the organisations ‘Wagile’ flow. A key component from my experience and observation at least is that the notion of project vs products combined with department based metrics. It’s important to have goals beyond functions which unite where the tactics to achieve the goals are fluid as you inspect and adapt at an organisation level. Where there any particular questions that you have on your mind specifically, maybe I can address them in a follow up blog post or response?